August | 2012 | Chat n Craft - What? white – red heart pounder 16 ounces, 4 ply. Crochet hook size US I/9/5.50 mm. With white chain 47, chain one turn. NOTE: From this point on all stitches are half double crochet. 1st row: In second stitch from hook do 2 half double crochet then do 1 half double crochet in each of the next stitch, then do 1 half double crochet, chain one, then 1 half double crochet, then 5 half double crochet in next 5 chains, then 1 half double crochet, chain one, 1 half double crochet, (do this 5 more times), then 1 half double crochet in each chain stitch, then 2 half double crochet in last stitch, chain one and turn. 2nd row: Do 2 half double crochet in top of first stitch then 1 half double crochet until you get to first half double crochet, chain one, half double crochet, then you do another half double crochet, chain one, half double crochet in that top stitch, then continue doing 1 half double crochet in each top stitch until the next half double crochet, chain one, half double crochet, then do the same until the end and then in last stitch from end do 2 half double crochet, chain one and turn. 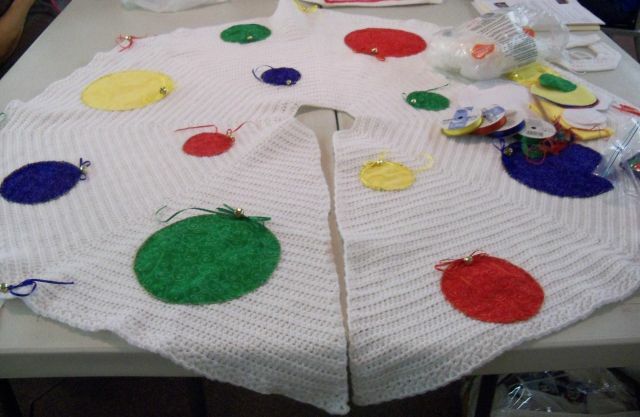 Continue repeating Row 2 until you have decided how big your tree skirt will be. ** Do half-double crochet in middle of first “V”, chain one and half-double crochet in the same “V”, repeat ** until end of row and finish off. 1. Cut paper rounds for a pattern, sizes Small, Medium, Large. 2. Cut 1 large, medium and small in red material. 3. Cut 1 large, medium and small in blue material. 4. Cut 1 large, medium and small in green material. 5. Cut 1 large, medium and small in yellow material. B. After the balls are cut from the material take clear liquid fabric fusion and lightly edge each ball. That way the material will not frazzle out. To sew the balls onto the skirt I took embroidery thread to match the material and a thread of gold and threaded them together through the needle. I used a blanket stitch around the ball to sew them down making sure not to go through to the back of the skirt. There will be eight triangles in the white skirt. Place 1 large (any color) round in 1 triangle, then place 1 medium and 1 small round (any color) in the 2nd triangle, then 1 large in the 3rd triangle and then 1 medium and 1 small in the 4th triangle, and so on until all rounds are in each triangle. C. To make toppers for balls use any type ribbon of choice but in red, green, yellow, and blue colors. Cut ribbon to size for bow, fold into bow then cut a 4 inch piece of ribbon in same color and put a jingle bell on the 4 inch piece of ribbon and tie with knot then take the same 4 inch piece of ribbon and tie it around bow. Then sew the bow to the top of the ball. It makes the gold topper for the Christmas ball. Match the ribbon to the material. Make a string on the ribbon so that it makes a curly ribbon hanging down. I made a one loop string bow for the small ball, a two loop string bow for the medium ball and a three loop string bow for the large ball. I used clear liquid fabric fusion to make sure the knot stayed put then sewed the knot to the top of the ball then used the fabric fusion to the string. It will not come undone. D. At the tip of each triangle I made another string bow, using any color and one bell. I made a two loop string bow, then cut a 4 inch piece of matching ribbon, slipped a bell onto it and then tied the 4 inch ribbon onto the bow, then slipped the ends of the 4 inch ribbon through a loop at the tip of the triangle and tied it in the back of the white crochet loop. Then I left the ends on either side loose and just put a bit of fabric fusion to the back to make sure it would not come loose. You will find some Crochet and Knitting Entrelac from the classes we have done this year, plus lots more what they have been working on. Some you will see in our August Lobby Display at Joplin Public Library or you can see it on one of our blog pages.